Is it time to finally replace those drafty old windows on your home? 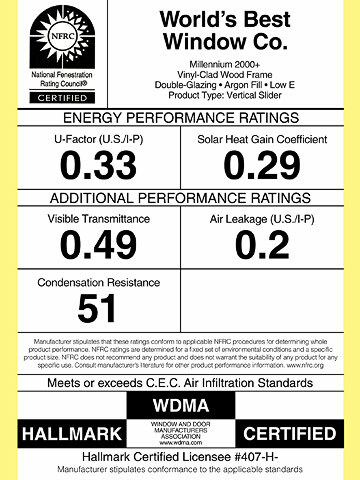 With the current emphasis on energy efficient windows, the National Fenestration Rating Council (NFRC) has designed an energy-performance label to guide contractors and homeowners in their search for the perfect window. Since the weather conditions in Minnesota vary widely from season to season, checking the label before ordering the window can make a big difference in how much the window can help keep energy costs to a minimum. Condensation resistance measures the ability of a product to resist the formation of condensation on the interior surface of that product. The higher the CR rating, the better that product is at resisting condensation formation. CR is expressed as a number between 0 and 100. This rating is optional and manufacturers can choose not to include it. NFRC energy efficiency ratings are important to understand to ensure that the product you’ll purchase offers superior performance. For more information on NFRC ratings, visit the organization’s website at www.nfrc.org. There are so many things to consider when shopping for replacement windows; let The Chuba Company help with their years of exterior remodeling and window replacement expertise. With over 125 years of combined experience in the roofing and exterior construction industry, The Chuba Company provides quality installation and dedication to our clients. Contact The Chuba Company today!